Is your company involved in a merger, takeover or joint venture? If so, then it is possible that you have to notify this “concentration” in advance to the Fair Trade Authority Curaçao. This has been laid down in Article 5.2 of the National Ordinance on competition. On this page, you can read more about the obligation to notify concentrations. Additionally, a brochure about the obligation to notify mergers and takeovers is available in English. To whom does the obligation to notify concentrations apply? The obligation to notify concentrations applies to all national and foreign companies that perform economic activities in Curaçao. Economic activities may comprise products and/or services offered in the market by companies. They not only include ordinary firms but also, for example, independent professionals, state-owned companies [in Dutch: overheids-NV] and some foundations. Which concentrations should I notify to the FTAC? the companies concerned together create or strengthen a market share of at least 30% in one or more “relevant markets” in Curaçao. You can read about what a relevant market is in this brochure. The concentration should be sufficiently concrete before you make the notification. There should at least be an agreement between the relevant companies about the outlines of the concentration. For example, on the basis of a letter of intent. Why is there an obligation to notify concentrations? Concentrations may lead to companies with a dominant position and as such to less competition in Curaçao. The obligation to notify gives the FTAC the opportunity to monitor the creation and strengthening of dominant positions of companies. Having a dominant position is not prohibited under the National Ordinance on competition, but the abuse thereof is. In the event of abuse of a dominant position, or in order to prevent abuse, the FTAC may take action. More information about this can be found in the brochure about the prohibition on the abuse of a dominant position. What information should I provide in case of a notification of a concentration? In the event of a notification of a concentration, you should provide the information which is requested in the notification form. This form is available in English. Are there any costs involved when notifying a concentration? No, the FTAC does not charge a fee for the notification of a concentration. 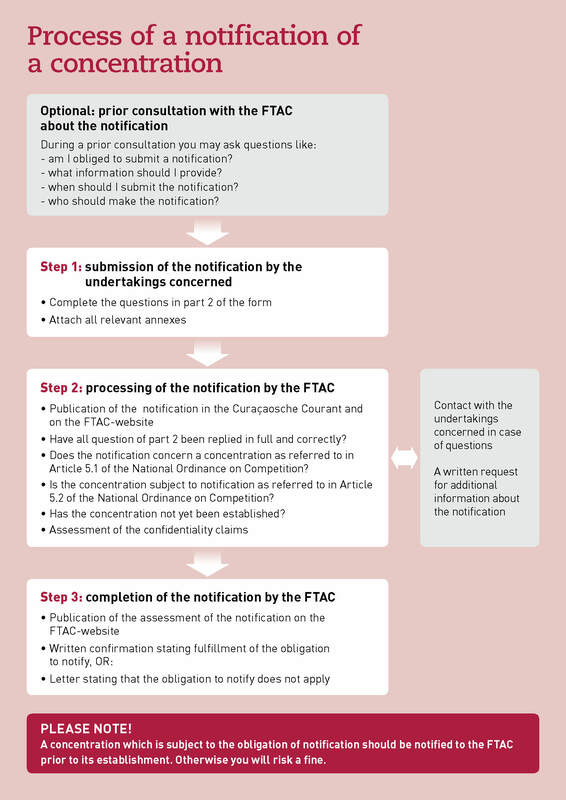 How does the FTAC handle a notification of a concentration?